When Leon´s son Franklin Stacey was ready to retire he sold his family business to a young employee with visions of a family of his own. Today, more than twenty years later, that young man, Vinny Lozzi, serves as President of Stacey´s Home Décor. And, like the Stacey´s, Vinny works side by side with his son, Tony. As a family-run window treatment business that depends on customer referrals they approach the business with a sense of integrity and deep commitment to customer service. 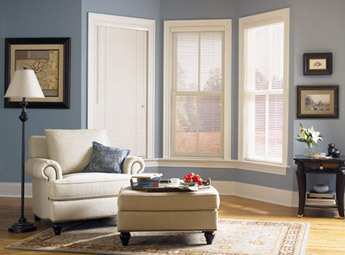 We provide our customers with the most dependable and long lasting Winthrop shutters, new blinds and draperies. Stacey's Home Decor offers you the best Winthrop window treatment products at the most reasonable prices backed with a 100% satisfaction guarantee. We provide free estimates, measuring, installation and in home consultations in Winthrop that fit around your schedule. Draperies in today's lingo generally refer interchangeably to drapes and curtains. However, this is not strictly true. Traditionally, windows would be treated with up to three layers of curtain: a light sash which filters light, a draw curtain to block light completely, and an over-drapery which functioned decoratively only. Moreover, in formal rooms, these layers of curtain may have been covered with a valence to hide hardware. However, modern rooms are treated with draperies differently, and sashes are often called curtains, while draperies are those materials that draw to completely cover a window and block light. Regardless of how you define draperies, decorating your windows with the right colour and material can make or break a room. In fact, even more minor details such as the shape, length, and style of draperies can have a significant impact. Ultimately, when decorating with drapes or curtains, you should consider these features in the bigger picture of the room. Are you looking to create a bright, breezy appearance that would be best served with a lighter, more colourful fabric? Or are you trying to create an elegant, traditional design that might best be served by heavy drapes with embroidered details? The function or purpose of the room should influence your drapery decorating decisions.